It's time for another RV trip before it gets too hot in the South. It's not any cooler in South Louisiana, but a totally different culture from that only a few hundred miles to the west in Texas. One of the first things you notice around Lafayette and points south is that French is the major second language that is spoken. In fact, the public signs that in Texas are in English/Spanish, here are English/French. The history and culture of the region are just as different as their languages. 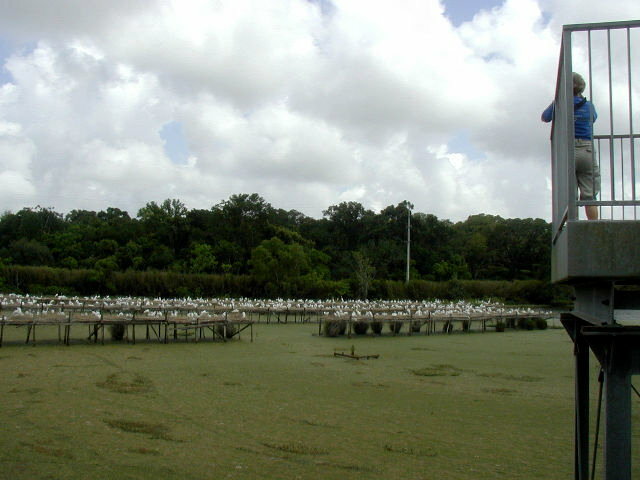 This was our first immersion into Cajun culture and was quite an interesting experience and one that we really enjoyed. We hope that you enjoy some of our brief descriptions and photos of our trip to Acadiana. [Monday] May 10th we left home about 11 am, and drove from Richmond toward Louisiana on IH-10. After a stop at the Louisiana Welcome Center, we made it to Lafayette where we took US-90 south to Maxie's Mobile Valley Overnight Campground in Broussard and arrived about 6pm. 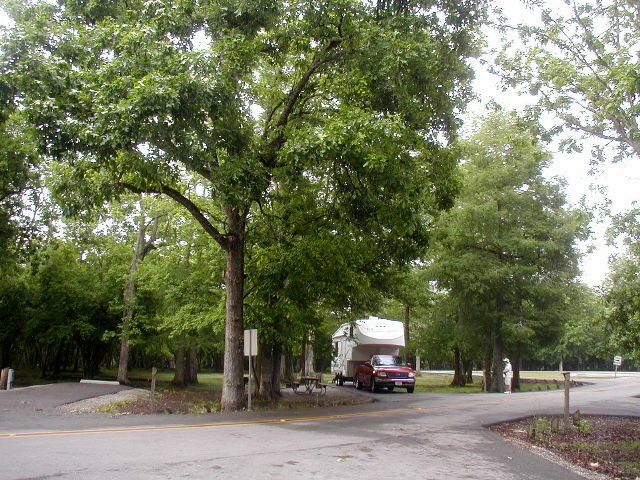 It's a good campground but made up mainly of local full-time residents. It is convenient to Lafayette. [Tuesday] In the morning we drove back into Lafayette to visit the Jean Lafitte National Historical Park and Preserve that is run by the National Park Service. 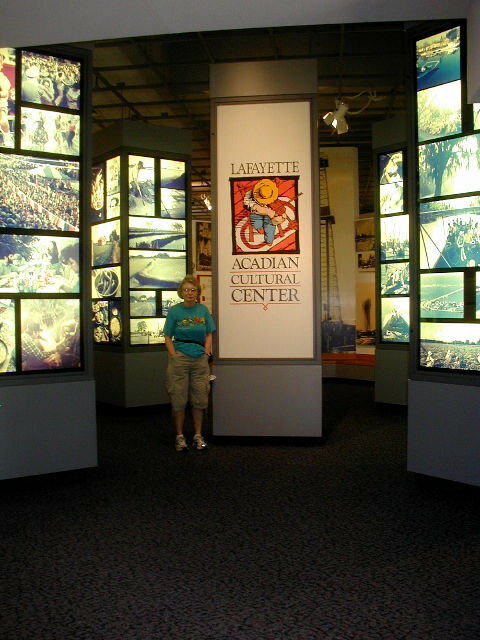 The Museum gives the history and culture of the Acadian people that were exiled from Nova Scotia and relocated to southern Louisiana and became the modern day Cajuns. A movie theater in the Museum shows a movie on the exile and another movie on the Atchafalaya River region. It was well worth the 2 hours we spent there. 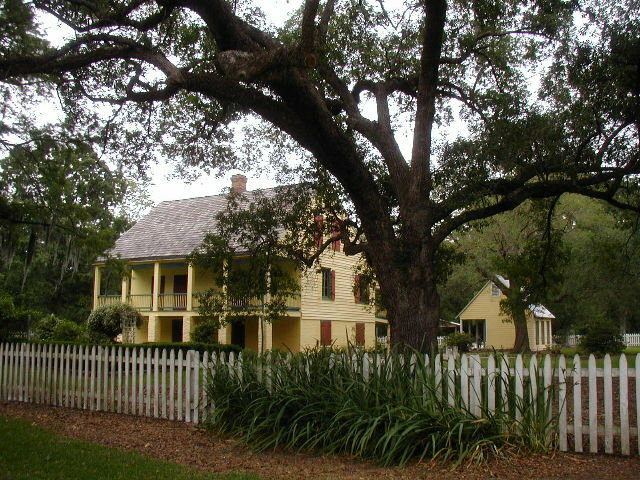 < The Jean Lafitte National Historical Park and Preserve. Please wait a few minutes for the small photos to load. Then click on a small photo to see it enlarged. After lunch we drove to Lake Martin, east of Lafayette. This swamp type lake looks to be about one foot deep and populated with many cypress trees with thousands of waterfowl this time of year in the Rookery. 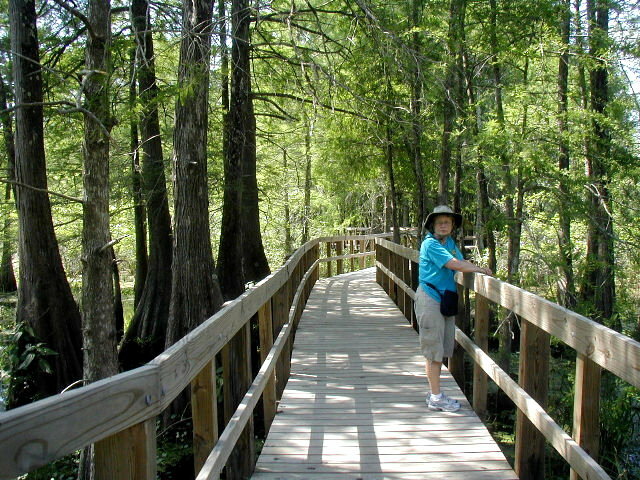 We saw Egrets, Herons, and Spoonbills nesting in the cypress trees growing in the water. There is a nice boardwalk that goes through a portion of the lake. We saw nesting Prothonotary Warblers as we walked the boardwalk. 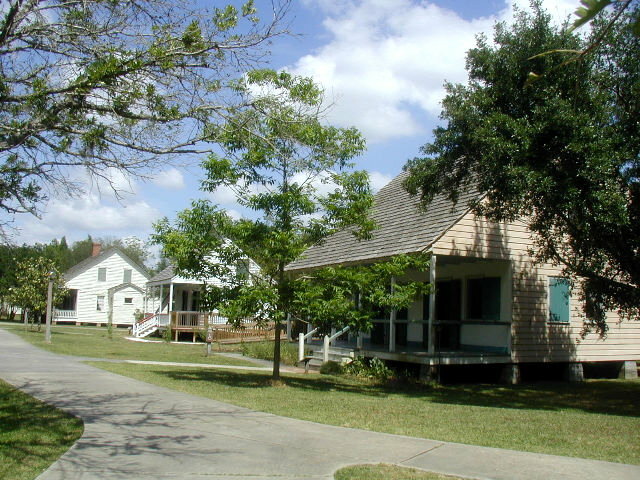 [Wednesday] Located across the bayou from the Jean Lafitte Center is Vermilionville, which we decided to tour today. Vermilionville authentically portrays a way of life preserved with a distinctly French accent. 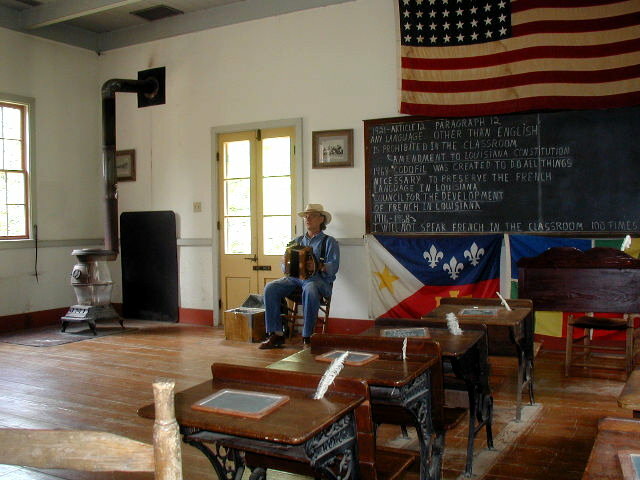 Situated on the banks of the Bayou Vermilion, this Cajun/Creole heritage and folklife park recreates life in the Acadiana area between 1765 and 1890. Six restored original historic homes and thirteen reproductions of period buildings comprise the village. In 1755, French-speaking Acadians were sent into exile by the British. 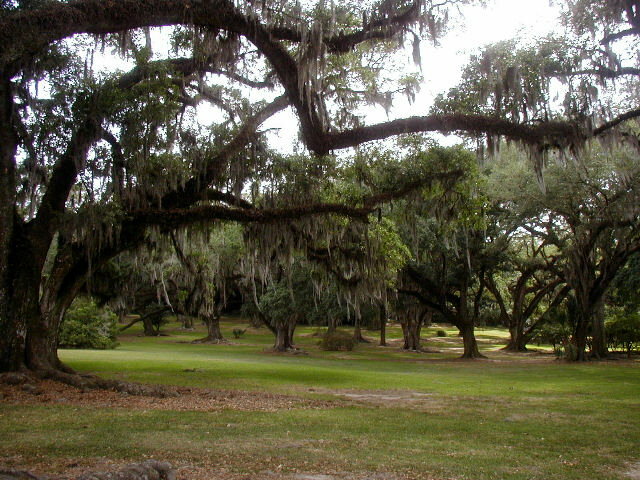 Forced to leave their homeland in Nova Scotia, Canada, many of these settlers, now known as "Cajuns," found a new home in the fertile marshlands and prairies of South Louisiana, where they were welcomed by the Spanish who controlled Louisiana at that time, because of their Catholic religion. We spent the majority of the day there. 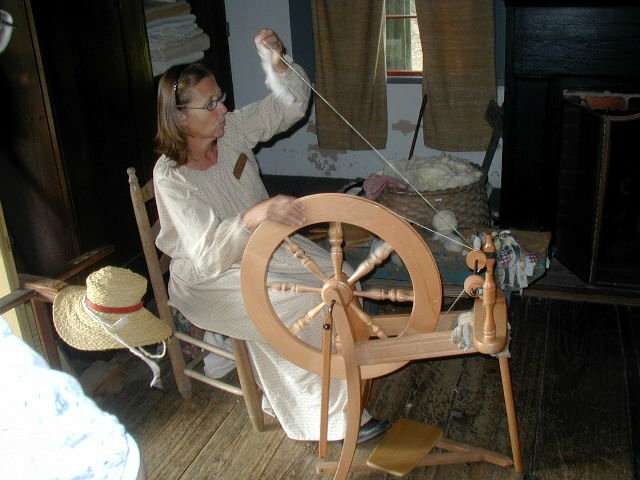 In most of the structures, costumed interpreters demonstrate traditional crafts or musical styles. 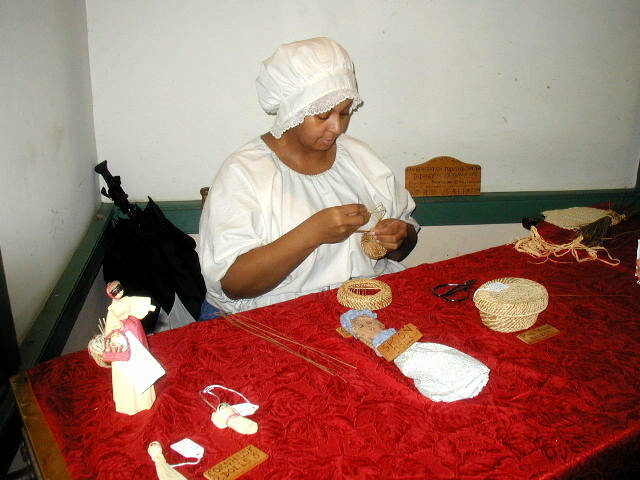 They were very knowledgeable in their crafts and on the Cajun lifestyle of the late 1700's. 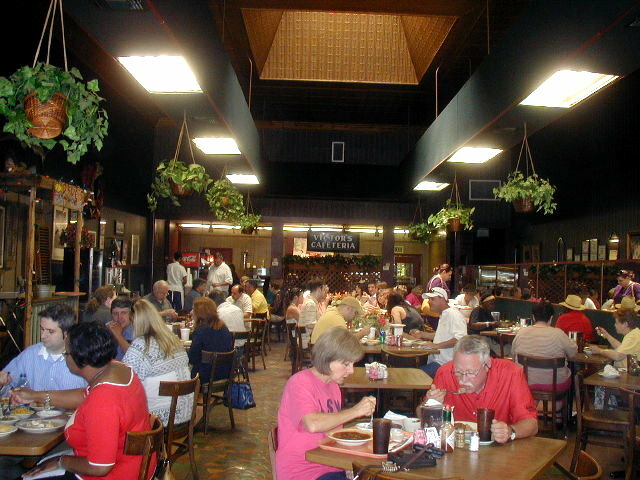 We enjoyed a delicious Cajun lunch at the restaurant that is a part of the cultural park. After we returned to the trailer, we hitched up and traveled a few miles southeast to St. Martinville, where we stopped at Catfish Heaven Aqua Farm & RV Park. 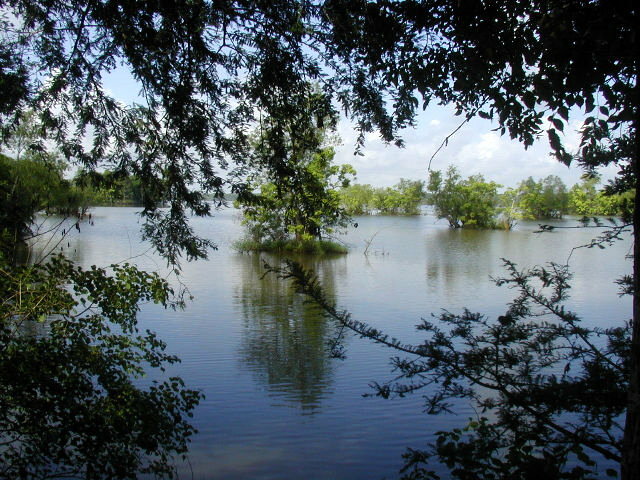 In addition to the campsites, they have stocked catfish ponds and one can enjoy a fresh catch of fish for a fee. 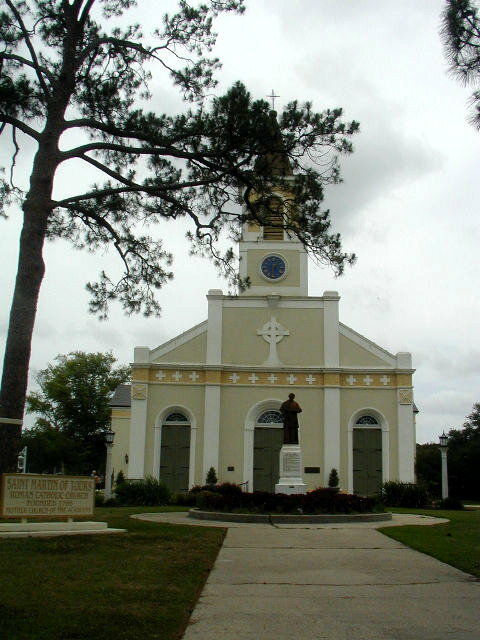 [Thursday] Today we spent the day visiting St. Martinville. 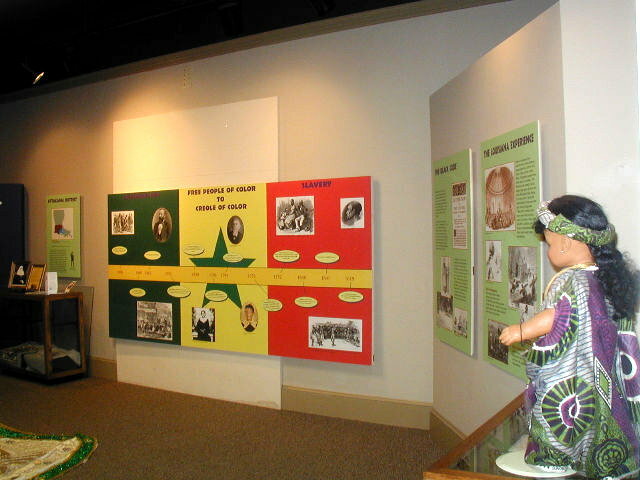 We started out at the Cultural Heritage Center, which houses both the Acadian Diaspora and the African Diaspora Museums. 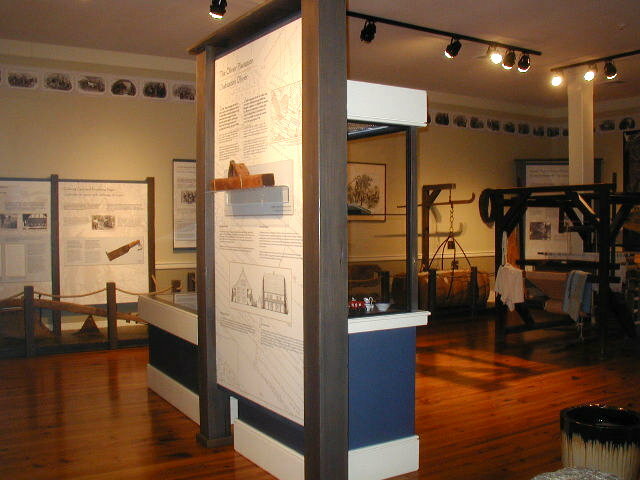 Both museums share a similar storyline of peoples forced from their homelands to Louisiana where they found a new home. They do a good job of highlighting the lives of the two different groups as they settled into Louisiana. 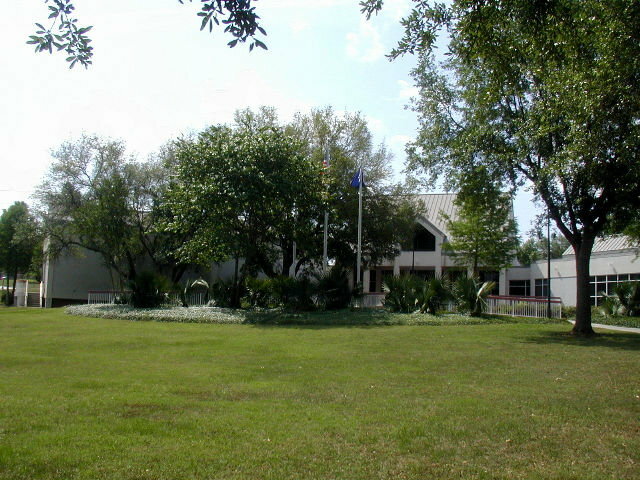 Next door was the Museum of the Acadian Memorial, which contains a mural of the "Arrival of the Acadians in Louisiana" by Robert Dafford. A Wall of Names lists 3,000 names of Acadian refugees who could be documented in Louisiana records. 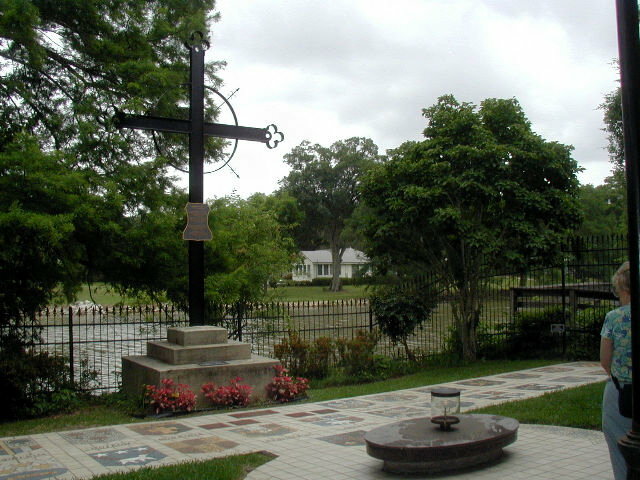 Outside in a garden are the Deportation Cross, the Eternal Flame and Mosaics of Acadian Family Coats of Arms. A few feet beyond are the rambling Bayou Teche (a river like a snake). 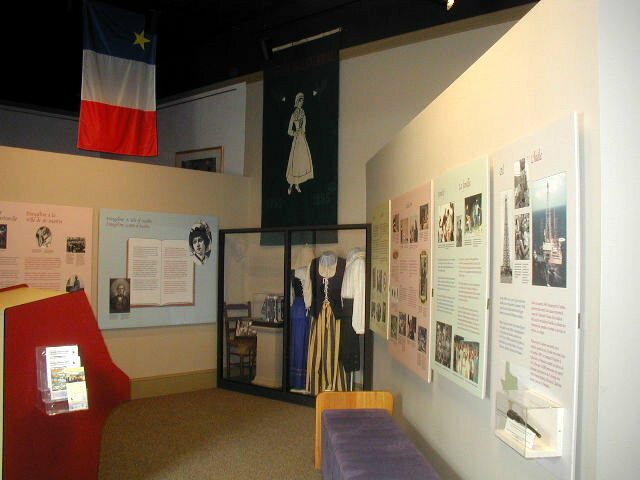 < Acadian Diaspora Museum. < African Diaspora Museum. 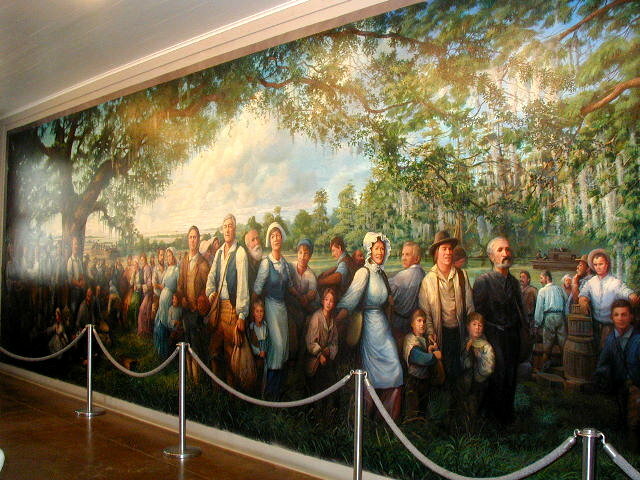 < "Arrival of the Acadians in Louisiana." < Deportation Cross & Eternal Flame. We stopped for lunch at Le Petit Paris Cafe in the Old Bank Building c. 1893. An interesting sign across the street in front of the St. Martin of Tours Catholic Church tells of a semi-feudal arrangement that existed from 1795 to 1890, where town property holders paid an "annual and perpetual" rent to the church congregation. < Le Petit Paris Cafe & St. Martinville Historic Sign. 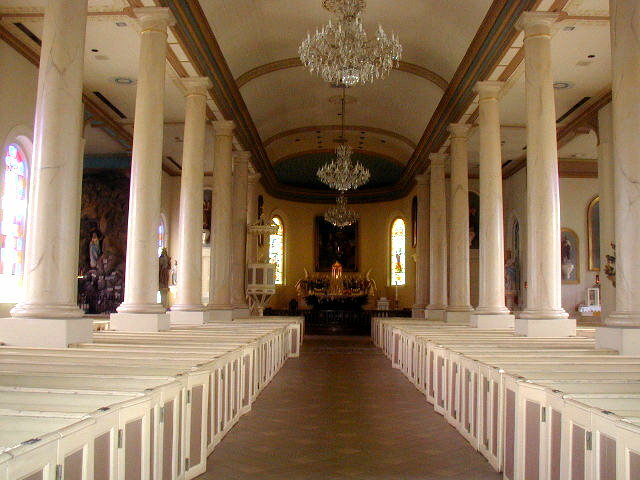 < St. Martin of Tours Catholic Church. 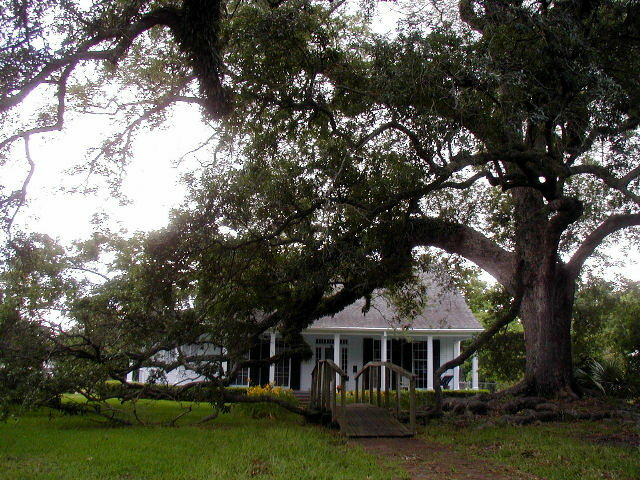 Our next stop was the Longfellow-Evangeline State Historic Site, Louisiana's first State Park. 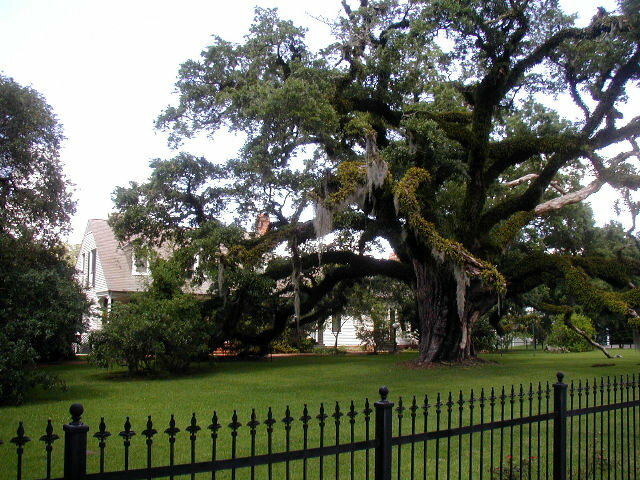 The site tells the tale of the French-speaking people of the Bayou Teche area. We took a guided tour of the historic Maison Olivier home, as well as visiting the Museum and watching a video of the history of the region. < Maison Olivier Home. 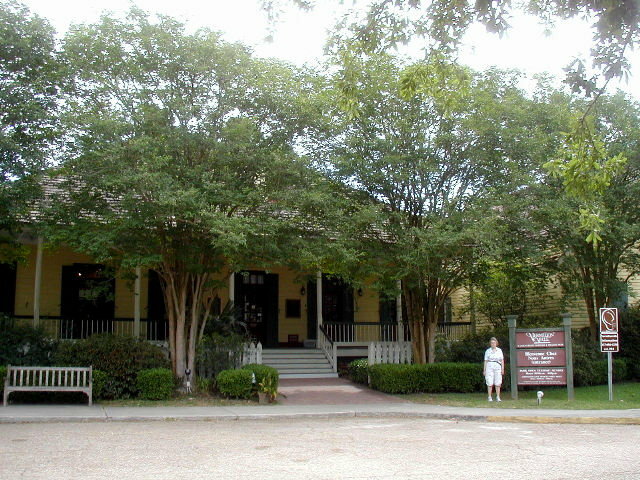 < Longfeller-Evangeline State Historic Site Museum. [Friday] This morning we pulled the trailer to the boat launch and took a swamp tour on Lake Martin, southeast of Lafayette. There are several services operating out of the boat launch on Rookery Rd, but we decided that Champagne's Cajun Swamp Tours looked like the best choice. Their brochure said that they were featured in National Geographic, Smithsonian Magazine and USA Today. It is run by Brian Champagne, a true Cajun born, raised and still living on the banks of Bayou Teche. He gave an interesting 2-hour tour of the swamps surrounding the lake highlighting a mother alligator and her brood, as well as other swamp birds and mammals. It's fortunate that he speaks Cajun French as well as English, since half of our 14-person group spoke only French. < < Lake Martin swamp. 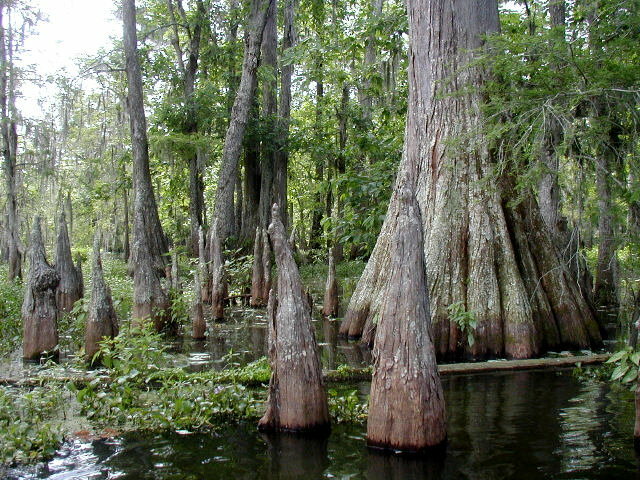 < Cypress knees. 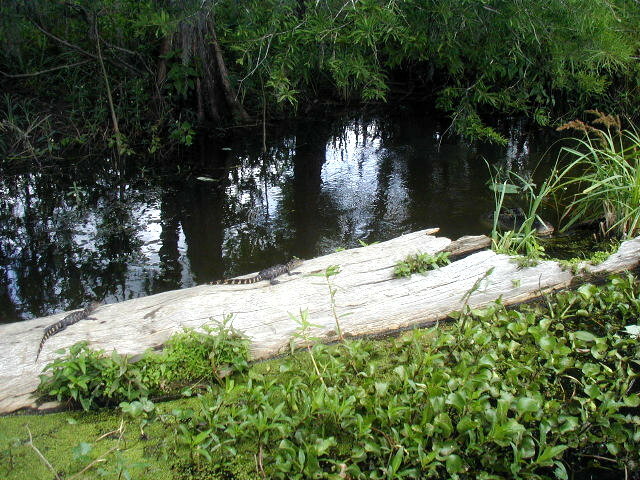 < Mother alligator and babies. We ate lunch in the trailer next to the lake. 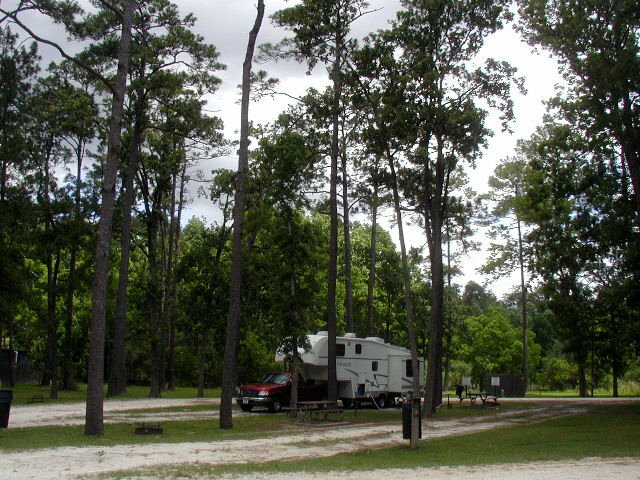 Afterwards, we drove down LA-31 to New Iberia, where we checked into Chase RV Park. 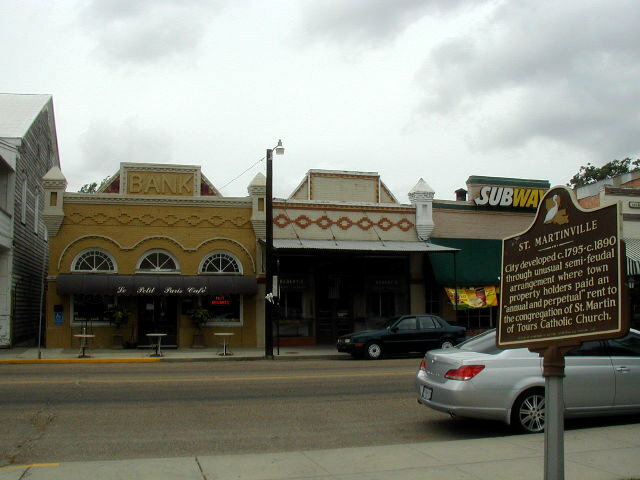 [Saturday] After a morning visit to the grocery store and an early lunch, we drove the short trip from New Iberia to Avery Island. 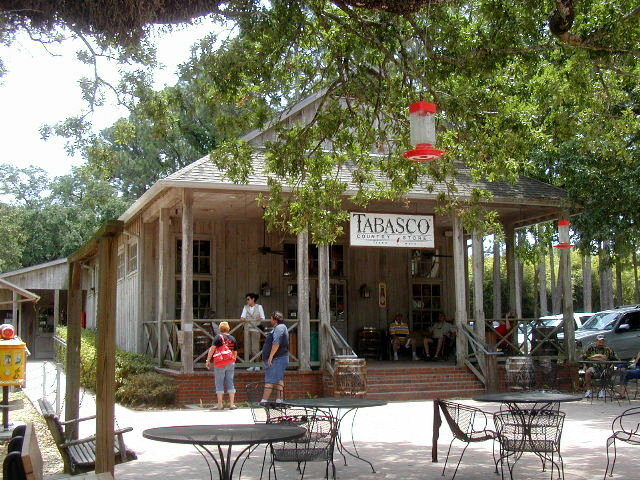 Avery Island is the home of McIlhenny Company and Tabasco Pepper Sauce. You pay a dollar toll to get onto the island which is surrounded by the Bayou Petit Anse. The island is a giant underground salt dome that is thought to be as deep as Mt. Everest is tall. We took the "tour" of the plant, which consisted of a video explaining all the operations, including seed collection, planting, harvesting, processing and concluded with a walk along a glassed hallway of the factory. 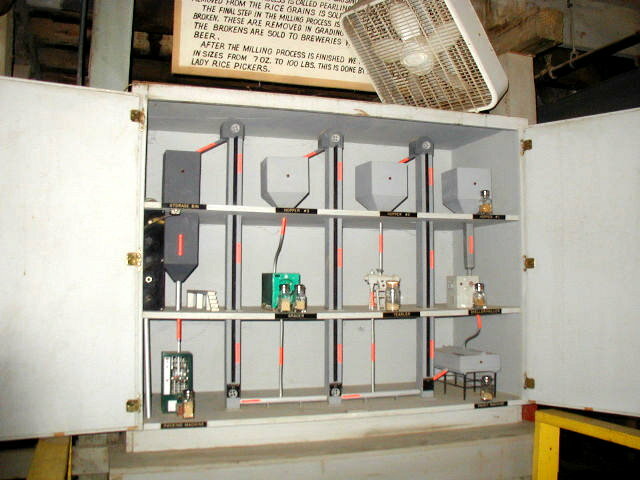 However the factory was not in operation on Saturday so there was nothing to see in operation. 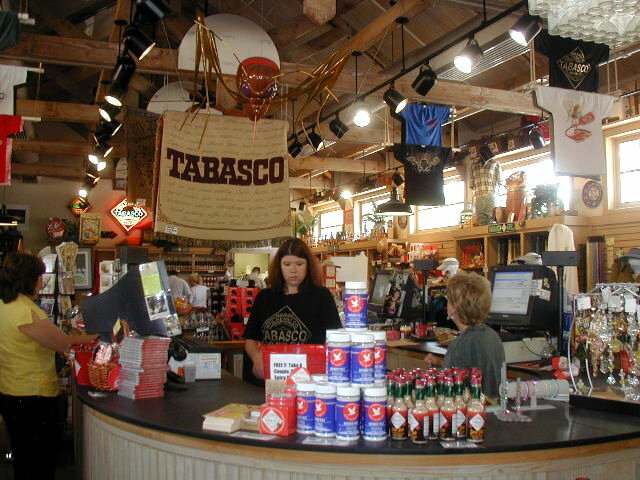 After the plant tour, we went to the Company Store, where you could taste most of the Tabasco branded products. 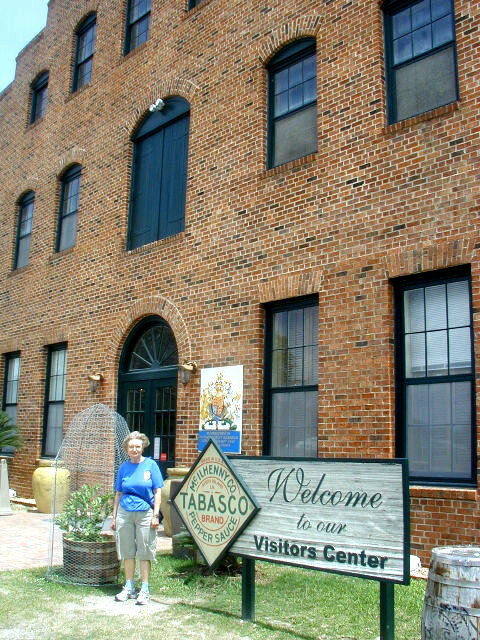 < Kay at entrance to Tabasco factory. We then went across the road to Jungle Gardens of Avery Island. You drive through the expanse of old Spanish Moss covered Oak trees, large forests of Bamboo and some Palm varieties and stop at various points as you desire. The only color they have is Camellias in February and Azaleas in March. There was nothing in bloom in May and the scenery was pretty much what you see anywhere in this part of Louisiana. The only thing that stood out for us was the Bird City scantuary that McIlhenny created to save the Snowy Egret from extinction. We were here at the peak season for nesting so there were wall-to-wall birds on the nests. 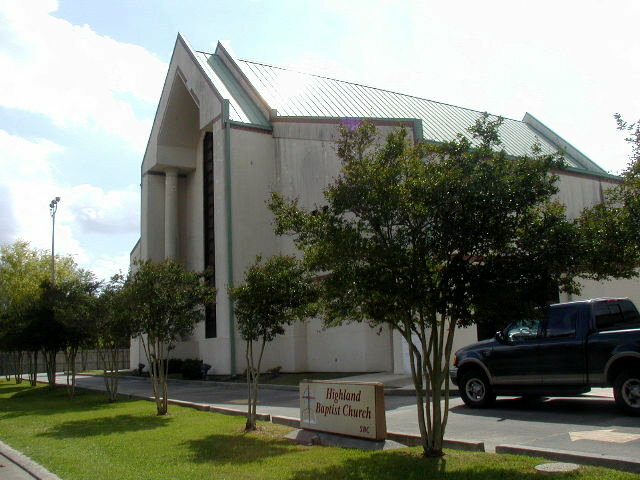 [Sunday] We went to church at Highland Baptist Church in New Iberia. It was a very inspirational contemporary worship service and thought provoking sermon. We met Pastor David Denton afterwards at the door and he was very friendly. We enjoyed our visit. After lunch we took the Residential Historic District Walking Tour, using the guide from the Tourist Center. There were 55 residences listed in the 6 block portion of E. Main St.
< c.1930 Home. - Gilbert Oak c.1831. [Monday] After breakfast we went into New Iberia where we toured the Shadows on-the-Teche. 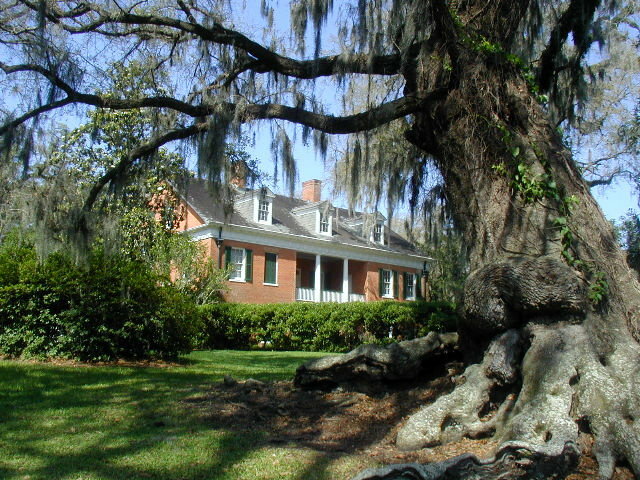 The home was built in 1834 by David Weeks, a sugarcane planter. 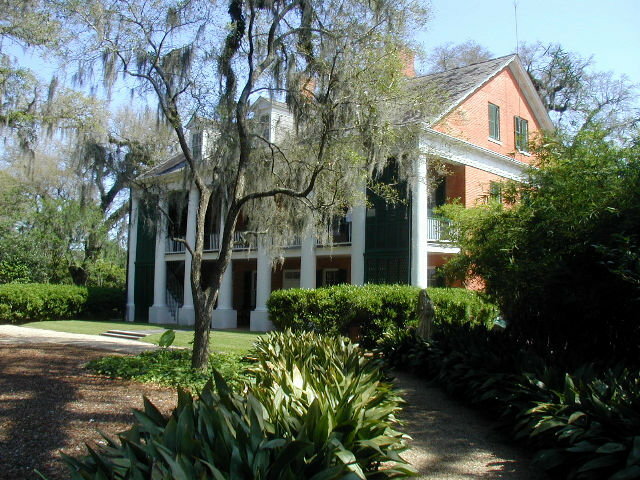 The home overlooks the Bayou Teche. Like many other old homes we have visited, Mr. Weeks died by the time the home was completed and his widow became responsible for it's upkeep and the running of the plantation. They had many slaves that made the task more manageable. 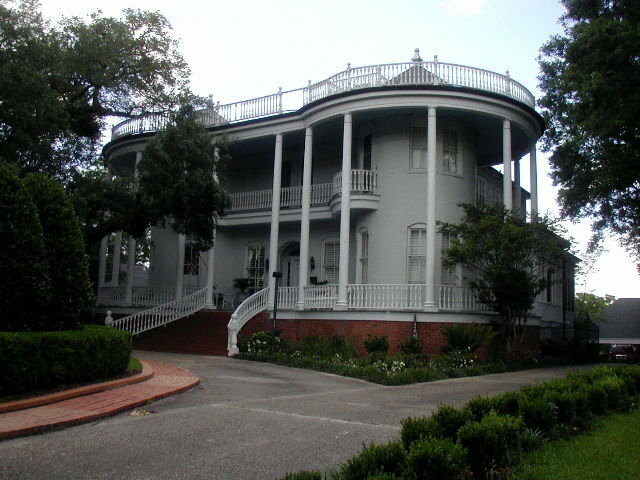 The home was of a Caribbean type design, where most of the rooms were constructed for good ventilation. 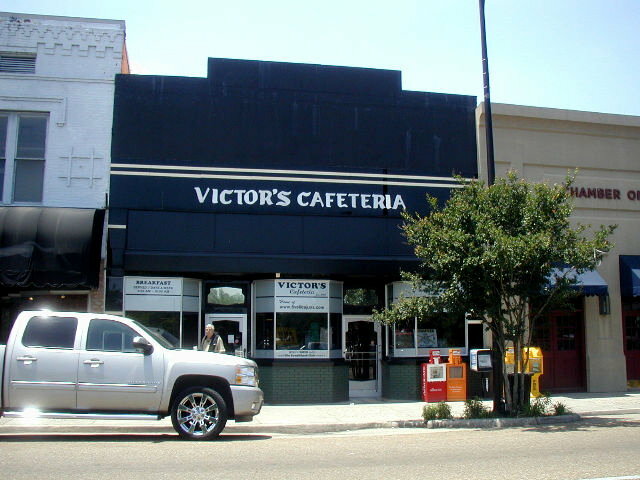 After the tour, we took the walking tour of the Commercial District, followed by a authentic Cajun lunch at Victor's Cafeteria. 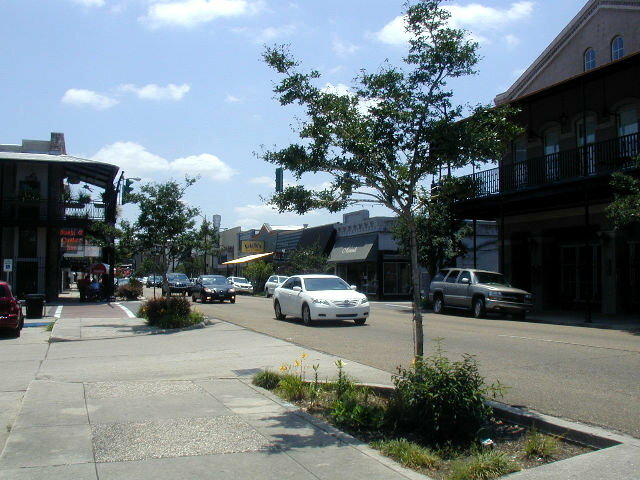 < Historic downtown New Iberia. In the afternoon we took a tour of the Konriko Company Rice Mill. 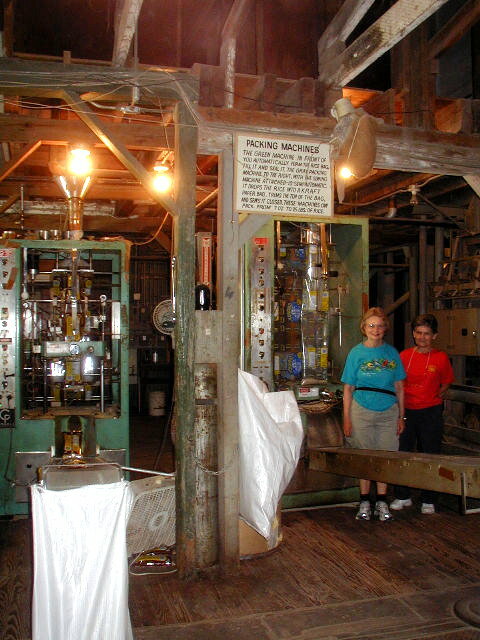 It is America's Oldest Rice Mill. 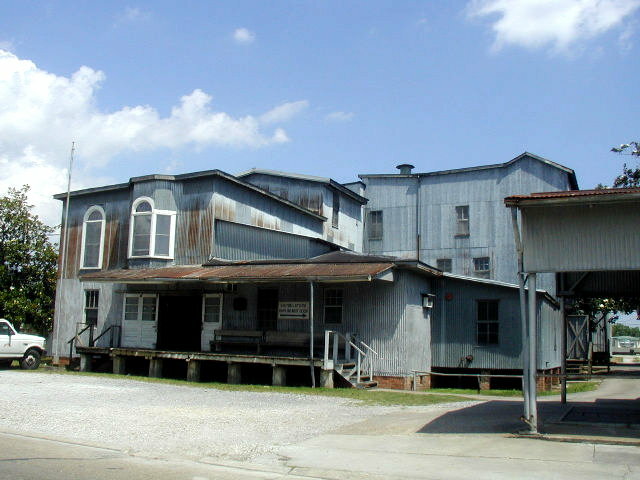 The founder, Phillip Conrad, Sr. built the Conrad Rice Mill in 1912. The current company and product name was derived from "KONrad RIce KOmpany", or KONRIKO. The mill was not in operation at the time of our tour, but the guide explained how the rice hulls are removed, the brand removed and the white rice packaged. It turns out to be a relatively simple process that is performed by a few machines that are connected by augers that move the rice along. < KONRIKO Rice Mill. < Kay with the tour guide. [Tuesday] We left New Iberia in the morning and pulled the trailer to Lake Fausse Pointe State Park that is located east of St. Martinville. 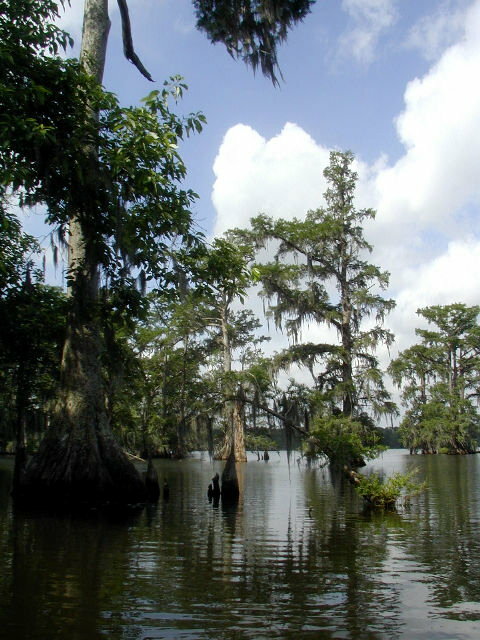 The park occupies a 6000-acre site that was once part of the Atchafalaya Basin. 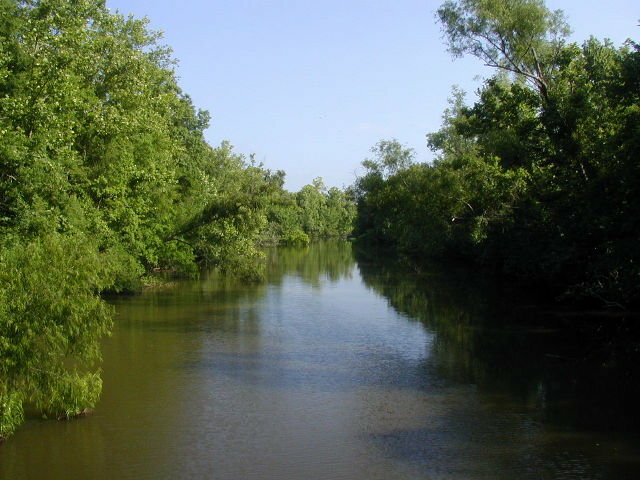 Prior to the 20th century, the Basin was a vast swamp enclosed by the natural levees of Bayou Teche and the Mississippi River. 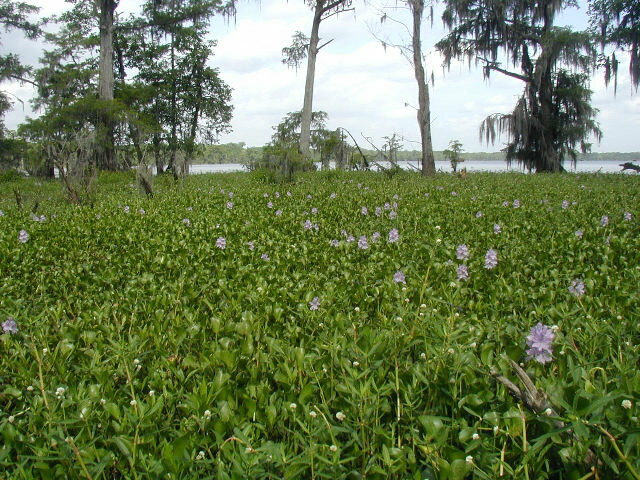 The construction of the east and west protection levees isolated the former Atchafalaya swampland; the park site lies within this isolated swamp, bound on the east by the protection levee and on the west by the natural levee of the Teche. We arrived around lunchtime and due to the heat, we decided to delay our exploring the park until mid-afternoon. However, the weather had other plans and a thunderstorm delayed our short hike until about 4:30 pm. The rain cooled it down to 70 degrees so we had a nice walk for a short distance on Trail B. Another nearby thunderstorm and the lateness of the day sent us back to the trailer about 6 pm. < Old Bird Island Chute. < Lake Fausse Pointe. [Wednesday] The morning was sunny and beautiful so after breakfast we decided to try a couple of the trails. We walked Trail A and Trail B on Old Bird Island. In the Chute, we saw a very large alligator gliding quietly down the chute. He took interest in us and stopped and sat still with just his eyes out of the water. A real troublemaker. We enjoyed the remainder of the trails without any more alligator visitors. After lunch we departed from the park and drove back west on I-10 to Lake Charles and the Sam Houston Jones State Park. < Our campsite. 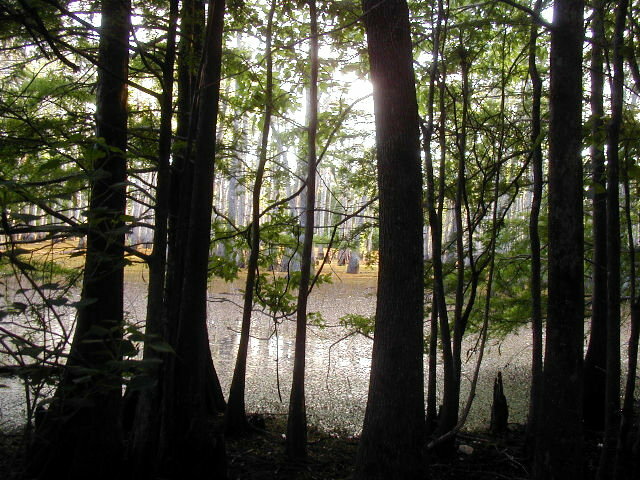 < Swamp next to campsite. 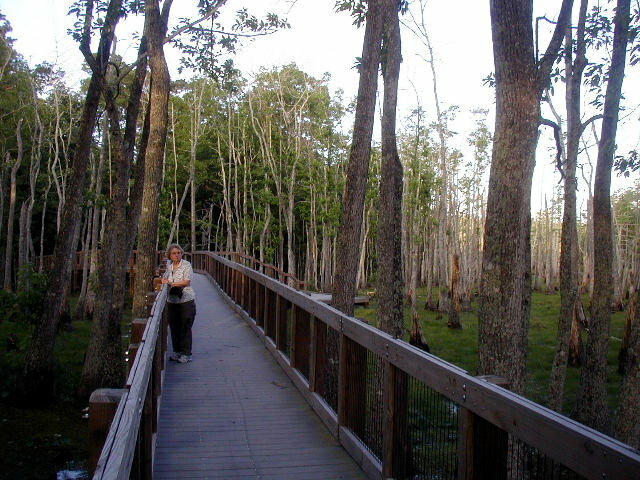 < Nice boardwalk over swamp. [Thursday] This morning we walked the Red Trail that runs along the bank of the Calcasieu River that borders the park. It was a nice trail along a wooded levee that had the river on one side and the swamp on the other. 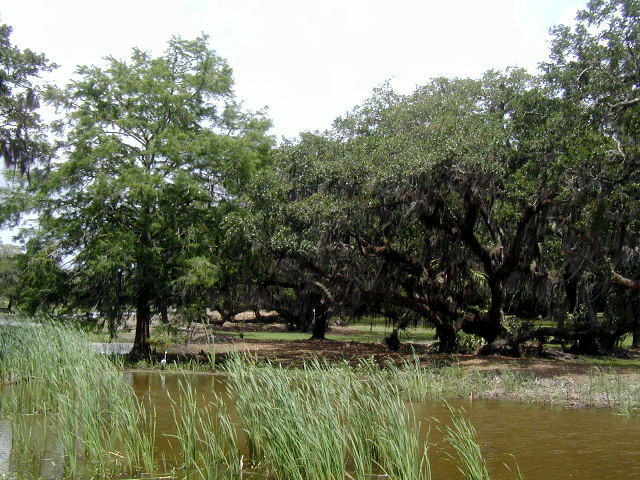 This was another swamp with Tupelo trees that control the mosquito population. We found ripe blackberries and huckleberries along the trail. After lunch we left the park and headed west on I-10 to Houston. We arrived home around 6pm. This draws to a close our visit to the Acadiana region of Louisiana. We hope you enjoyed the photos and brief descriptions of our activities. God willing, join us again soon for another RV adventure.